Peach and nectarine are the same species that are commercially sold as different fruits.They are nearly alike in size, texture and colour, but peaches have a characteristic fuzzy skin and nectarines have a shiny and smooth skin. The fuzz on peaches is due to the presence of hairs botanically known as trichomes. Since consumers do not like the fuzz, commercially grown peaches are mechanically brushed after harvest to remove the fuzz. You can find real fuzzy peaches at the farmers markets and roadside stands. Several genetic studies have concluded that nectarines are produced from a recessive gene and the fuzzy peach from a dominant gene (allele). Nectarines have also, arisen, many times from peach trees, often as bud sports. Nectarine and peach trees are virtually indistinguishable.Early nectarine varieties were small and white fleshed with green, red or yellow skins. Over the years nectarine varieties have been crossbred with one another and also with peaches. Cross breeding has yielded larger, peach-like nectarines with gold and crimson skin and yellow flesh. 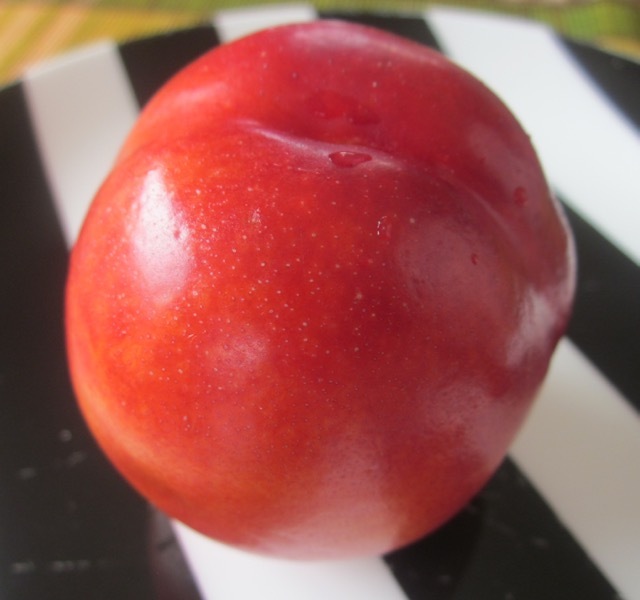 Nectarines are generally sweeter than peaches, They have a red, yellow or white flesh. The nectarine fruit may be a clingstone, free stone or part freestone. Part freestone/clingstone: also called semi-free stone. They are midway between clinging and free, so can be separated but with some effort. Freestone types preferred for eating fresh and clingstone for canning. 98% of USA crop is grown in California. Nectarines are also imported from South America and Middle East, during winter and early spring. The imported ones are not as sweet as the home grown ones, because they are picked earlier to allow for transportation and shipping. Once a mature nectarine is picked it doesn’t get much sweeter, but it does become juicier and softer at room temperature. Availability: nectarines are available throughout summer, peaking in July-August. One medium nectarine fruit about 150g: Calories, 63; protein 1.5 g, carbohydrate 15g; fat 0%, sodium 0%, cholesterol 0%, Vitamin A, 9% Vitamin C 12% RDA. Prev What is Coconut Sugar? Thank you for all of the very informative posts on different fruits vegetables and other food products. I think I sort of knew about nectarines, but strangely, I still prefer the peach, even with its fuzz! I had a peach pizza the other day. It was so good. I must give it another try. I always seem to buy more peach than nectarine too! Enjoy the week!